My dad told me he had two brothers in World War II, both of whom died – Pat in a riot in 1944, and John in 1943 in North Africa in a motorcycle accident. John was a dispatch rider. Pat, was 24 and John, only 19. ​In Ireland, in 1983, on a family trip, I drove down a boreen. A boreen is a Gaelic term for an unsealed road. In that part of rural Ireland there weren't any sealed roads. This section of road was not far from the Loftus historic house - Loftus property for generations, through research, learning my ancestor Lachtain was given this land in what subsequently became known as Attymass, County Mayo. 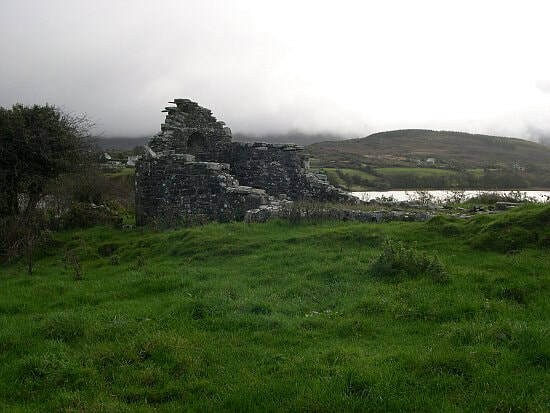 The land was given by his half-brother, Niall of the Nine Hostages around the year 520 AD and had been in the family ever since. On this section of road my two aunties told me a mysterious story. The ruins of Kildermoot Abbey, shown above, are located in Attymass, and it's easy to get a feel for the mysterious here. Near Samhain, in 1944, a neighbour saw a dead man walking. The dead man was Patrick Loftus, my uncle. Just getting on twilight the neighbour saw Pat with two unknown smaller men, in rustic, old-fashioned clothes. The neighbour noticed Pat was in his Army uniform, his Sergeant's stripes catching the fading light. He was hailing Pat, calling out that Pat should accompany him to a dance. Pat said he had to go somewhere else. The friendly neighbour responded that he'd drop around the house the following day. When he did, those at home told him as far as they knew Pat was still in England and he must be mistaken. He said he wasn't – it was definitely Pat with these two strangers and they seemed on their way somewhere, walking up a hill. The next day a telegraph arrived to say Pat had been killed in a riot in York with American serviceman. His death, timing wise, was shortly before the neighbour saw him. Later, after the drive, I walked off in the direction this took place. In a few minutes I was there. Off the road it had a dark, disturbing feel. I had a feeling I'd never felt before. I knew if I walked up the hill Pat walked up, I'd never be seen again. The rain started whispering. It became grey and cold. A sudden wind, the black branches surged up and down. Back at the family home the house shook, rain rattled the windows. Looking outside I could see that the roads were torrents – wind, rain and tumult. It was like something out of MacBeth. I told Mary-Ellen, my auntie, who owned the house where we were staying, the old Loftus house, where I'd been. She leaned forward and took my hand and made me promise I'd never go there again. I did not.